All refunds, straight returns, and order cancellations will be subject to a 10% restocking fee in the United States. Shipping charges are not refundable. We will honor returns within 48 hours of receiving if the product is not as described. No returns will be accepted, unless the item is grossly misstated or misrepresented. We encourage all buyers to be sure of model prior to purchase. 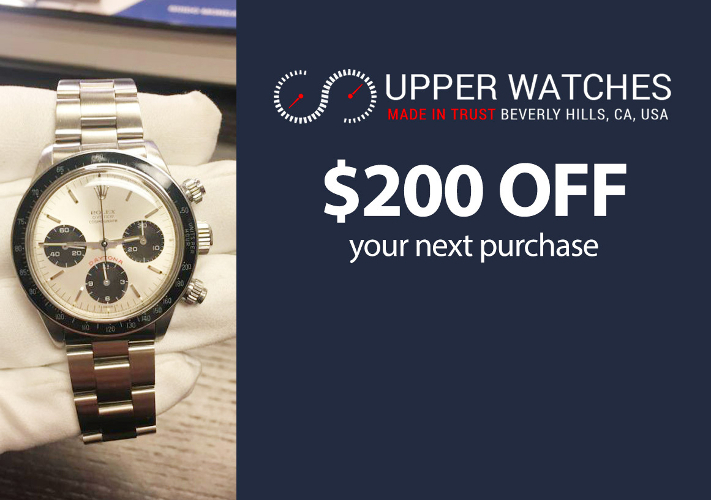 Return shipping and insurance should be pay by the buyer, UpperWatches.com will not be responsible for the return shipping. All refunds, straight returns, and order cancellations will be subject to a 15% restocking fee for the rest of the world. Shipping charges are not refundable. We will honor returns within 48 hours of receiving if the product is not as described. No returns will be accepted, unless the item is grossly misstated or misrepresented. We encourage all buyers to be sure of model prior to purchase. Return shipping and insurance should be pay by the buyer, UpperWatches.com will not be responsible for the return shipping. All items shipped to any address outside the United States are considered final sales and cannot be returned.